We hope that you all have a wonderful time wherever you may be over the holiday period. 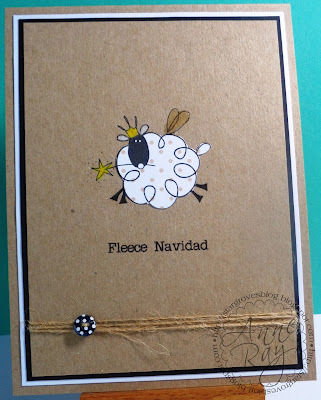 much time for crafting with everything else that's going on at this time of year. (of cloth or yarn) made or spun at home. lots of white space, gingham, knitting, sewing, folk art... you get the idea! Here are some examples to whet your whistles! 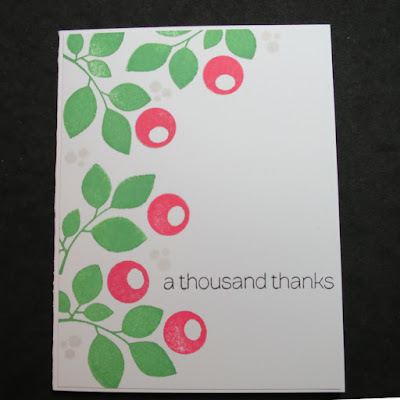 from a Stampin' Up Embosslit. The sentiment is computer generated. 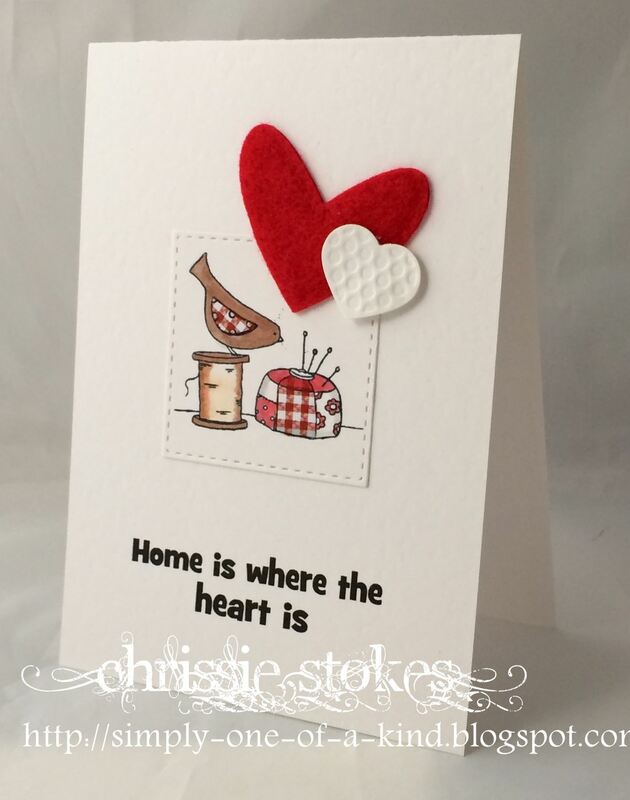 by Clearly Besotted, stamped and die cut from some patterned paper. 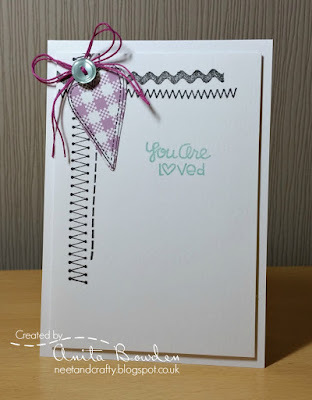 Chit Chat set in Celadon ink by Versa Color, to co-ordinate with the button. Paper pieced digi from Pink Petticoat on kraft, colouring with Inktense pencils. Computer generated sentiment, a dotty button and some twine added. and we would all love to have you visit us there. Hello there LIMettes - are you ready for a colourful showCASe! bunch you are - never ones for making it easy for us are you? great use of the challenge colours. splattering on the background too. on your blogs to show our thanks and appreciation! at 8.00am GMT - we hope you'll join us then! These challenges seem to come around really quickly! Are you up for a little fun? 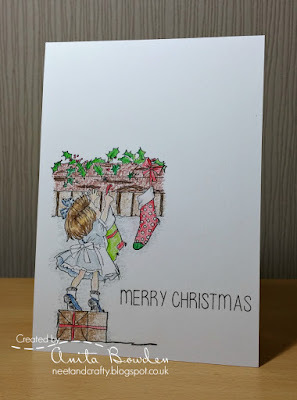 ONE LAYER CARD with lots of white space! something which may have been in one! Here are our examples to get you in the mood! 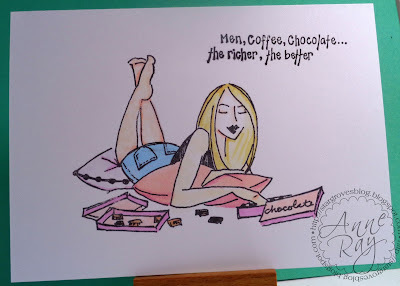 image and sentiment sum it up - at least the chocolate! for copyright-free colouring pages. This is one which can be easily downloaded. The sentiment was computer generated and I think is rather fitting for this image. It was coloured with alcohol pens and gently twinkled with Wink of Stella. I think pencils were a good choice for this style of image. 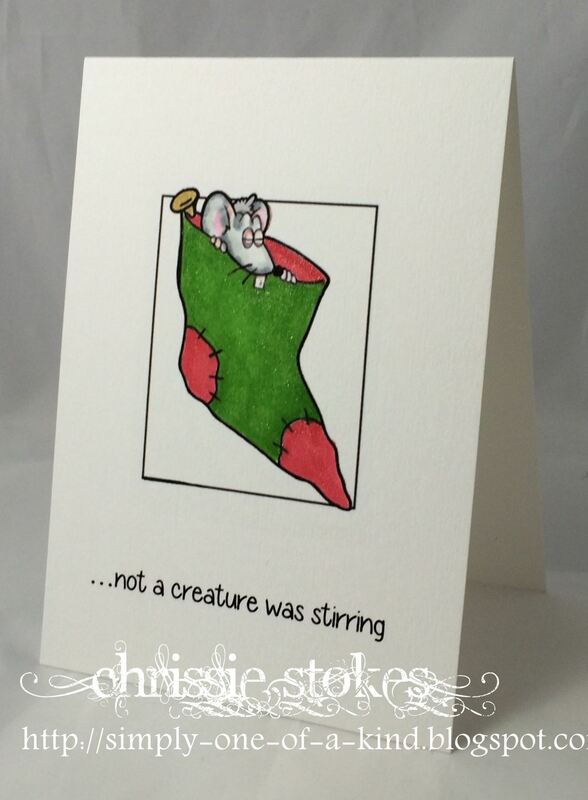 The sentiment is from Happy Little Stampers 'Mixed Christmas Sentiments'. We hope you enjoy the challenge and that you are feeling super festive! Here is our showcase for the Fruity challenge from week 252! What a great bunch of cards were on display! 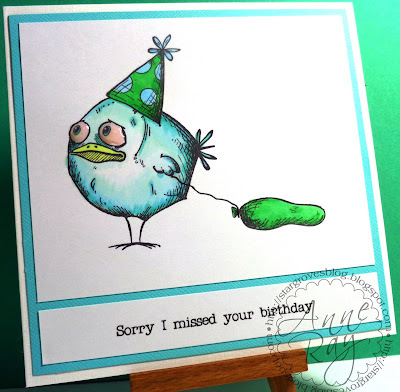 We all loved this card with its perfectly co-ordinated sentiment and image, and the inky backdrop is fantastic. 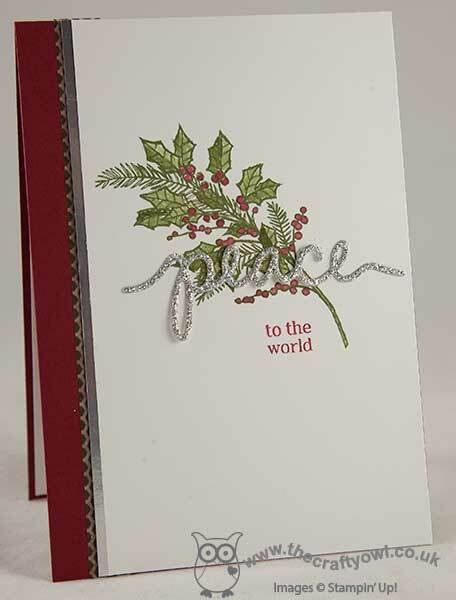 Joyce's stamping is so crisp and vibrant, a wonderful layout and the stamped plaid strip is flawless. A lovely traditional card, lots of white space, wonderful colouring and just the right amount of sparkle. We're sure you'll all agree that these are splendid indeed. Congratulations to you all. Please take our ShowCASe badge from the page at the top for your blogs. Our thoughts are with all the folk in Cumbria at the moment during the dreadful floods, let's hope we can support the businesses which are still operational in the area during this really trying time. There's still a little time to join this week's colour challenge which ends at 10pm GMT tonight, but another fun one will start in the morning at 8am, so do join us then! Morning LIMettes are we ready to have some colour-fun? the month means we've also a new sponsor to announce! Here's what the DT have created and we hope you feel inspired to play along. 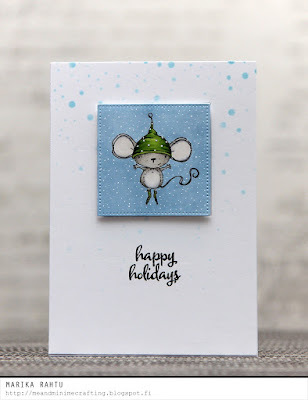 Please remember to keep your cards Clean and Simple with some yummy white space! I started by making a stencil using a die from Clearly Besotted's Leafy Accents and sponged Mowed Lawn Distress Ink onto a cardstock panel. 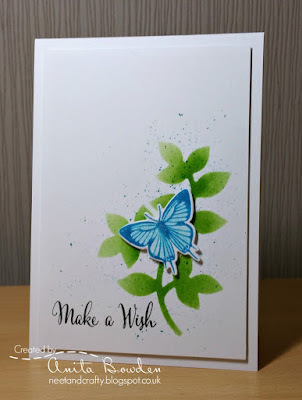 I then stamped the butterfly from Clearly Besotted's Elegant Butterflies set using Mermaid Lagoon Distress Ink, drawing in some of the ink with water, and die cut using the co-ordinating die. I stamped the sentiment, from Pure Florals Cosmos by Uniko and then created some ink splatters with a mix of Peacock Feathers Distress Ink and water. The butterfly was adhered on 3D foam and some clear Wink of Stella added to it for some shimmer. Glossy Accents on the eyes. The sentiment is computer generated. 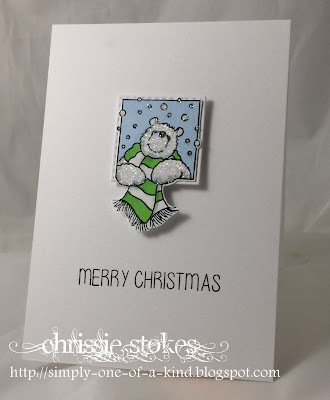 Here is a sweet little stamp from Hobby Art coloured with alcohol pens and with the bear gently twinkled with Glamour dust! After cutting out, it was mounted on a stitched square die-cut, popped onto dimensional pads and accompanied by a sentiment from Happy Little Stampers. subtle green with some gems from my stash to the centres of the snowflakes. We hope you have some fun and find a little time to play along! but we are almost skipping into a new year too! and today we are announcing our winner for November! and energy combined with other entertaining activities described in her cheery posts. 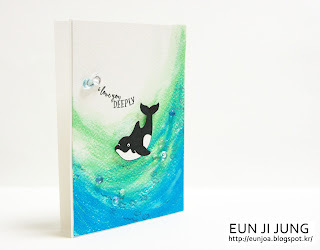 She certainly knows how to party as well as create stunning and inspirational cards. We love your work Viv and hope you'll continue to support our challenges. the top of the blog. We hope you'll 'wear' it with pride on your blog! Morning all, it's 'number-cruncher' time! numbers challenge and what a brilliant and fun collection to select from! Neon, bold, striking numbers - who can resist this eye-popper! Perfectly crisp, clean, classy and we love the stunning simplicity! Another crisp and clean card with elegant die-cut numbers in pretty pastel shades. All set against a striking and ornate clock face with the most awesome sentiment! Here's a discreet and super clever take on the numbers challenge! 'think outside the box' card. We hope you enjoy our showCASe and agree these are well worthy winners. appreciation for your continued support of our challenge. a card in to our fruity challenge which closes as 10pm GMT this evening.